Sorry I did not get around to a Wednesday WIPs. I came back from vacation and directly into tech week for my improv show. Plus I'm manning a table at a festival this weekend so my mind has been completely preoccupied with other things. And of course coming back to work after a week and a half away is never an easy slide. Either way I have not picked up a hook since Sunday night. But I AM making progress on my vest!! 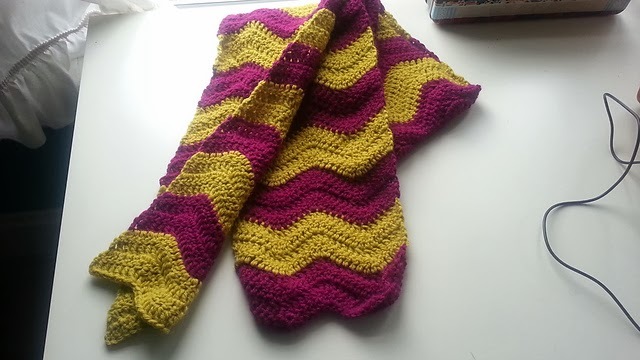 And I finished a scarf over vacation. Ta-da!!! I'm not sure what I'm doing with it yet. I had intended it to be for myself, but now that it's done I don't really care for the colors. 1) How would you describe your skin? White enough to be considered transparent. Like seriously pale. I frighten small children. If I had lighter hair I would be mistaken for an albino. 2) As a teenager, what was your acne like? Honestly, not all that bad. I definitely got pimples, but they were never really that bad. I'd say moderate. 3) When did you last escape something by the skin of your teeth? Hmmmm. Well a few months back I witnessed a pretty horrific accident on the freeway just ahead of me. Missed it by just a few yards. I drove right over some of the debris before I could slow down. It was not pretty. 4) What most recently gave you goosebumps? 5) When did you last burn yourself? I honestly can't remember, but I'm going to venture a guess and say it was while cooking. Which would be why I don't remember. Heh. Ok, not the best list, but it's something. Happy Friday! I hope everyone is well, and have a WONDERFUL weekend! Much love!! !